Athletic pedigree hasn’t been a problem in the Arnold’s household in Coopersburg. Susan and Mike Arnold’s three daughters, Kristin, Katelyn, and Maddie—human progeny—were each first-team All-State and All-Colonial League field hockey stars at Southern Lehigh High. Between 2006-17 they collected five league, and seven District XI championships. Kristin, a three-sport athlete, was a two-time national field hockey champion and an NCAA title game Most Valuable Player and All-American goalkeeper at West Chester University. Katelyn played basketball, made two Patriot League Tournament appearances and was a 2016 Scholar Athlete at Lafayette College. Maddie medaled in the javelin at leagues and is a freshman field hockey defender at Temple. Mike played football and baseball at Southern Lehigh. Susan was a cheerleader at Salisbury High, then in college. Her father, Bill Paulik, was the founding and career athletic director and boys basketball coach at Salisbury. So why wouldn’t they somehow, unknowingly, be attracted to, and then adopt, Kate, from The Sato Project in Puerto Rico? Now a television star, Kate’s showbiz name is “Bella.” Perhaps you watched her athleticism in Animal Planet’s Puppy Bowl XV on Super Bowl Sunday (Feb. 3) where the breed group Terrier companion-Shih Tzu-Chihuahua mix figured to be a Bissell MVP (Most Valuable Puppy) candidate. 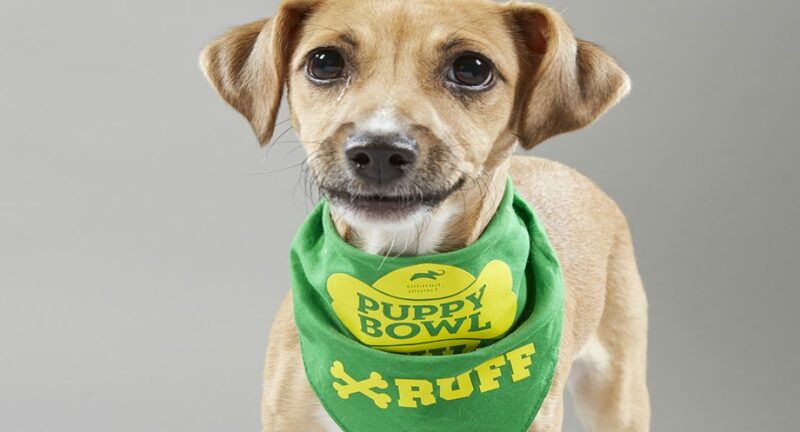 The Puppy Bowl pits “Team Ruff” against “Team Fluff” for the Chewy.com Lombarky Trophy. A touchdown is scored when a pup picks up a ball, chew, or squeaky toy and drags it into an end zone. It’s a field goal when a toy is kicked into an end zone. “Bella” is on Team Ruff: “She’s rough,” Katelyn says. Mostly, the family calls her Sato—Puerto Rican slang for a mongrel. Dead Dog Beach, where Hurricane Maria made landfall in 2017, is the “office” for The Sato Project, which following a helpless, elderly owner’s tip found Kate and her siblings in a nearby trashcan. Two weeks old, their eyes had just opened. All—Kate, Henry, Harry, Will, and Meghan—were named for Royals because their discovery coincided with the May weekend of the royal wedding. Harry, who was adopted by a Massachusetts family, is also in Puppy Bowl XV. There are six Sato adoptees in the Puppy Bowl, and another in Dog Bowl II, the older-dog version that aired the night before. One year, the rescue had 12 entries, but still no MVP. “I will not leave this earth until I have a Puerto Rican MVP,” Beckles says. With Mike, Katelyn completed an application, hardly knowing then that, if approved, they’d adopt a soon-to-be famous Sato, one which came with special instructions and legal agreements for participation in the Puppy Bowl, a Geico commercial during the show, an Animal Planet episode and even a Vermont wedding where the bridesmaids held puppies, not flowers. Different from her family’s athletic specialty, defense, “Bella” is an offensive player. That’s clear at home where she’s often carrying a bone her own length. Sometimes, she throws it down the upstairs steps because she can’t quite carry it. Sometimes, it’s Katelyn’s boot that comes tumbling down, or the pillows on her bed that get rearranged, or the cinnamon sticks in a Christmas display. “She’s a swiper,” Katelyn says. To build tolerance, the rescue snatches firewood from a built-in family room cubby, jumps a kettle, then an ottoman, and takes off through the house. “We’d be bored without dogs,” Mike admits. In New York City for taping, “Bella” had a town car limo driver. She hadn’t yet been to obedience training—where she’d finish last at South Mountain Dog Training in Emmaus because she wasn’t “fluff” enough to step inside a Hula Hoop—but she was paired with professionally-trained Husky and St. Bernard pups for the Geico commercial. If playing favorites plays a role in MVP voting, “Bella” is a favorite. Dan “The Ruff-eree” Schachner, the Puppy Bowl’s only on-field human the last eight years, fostered her. His first-ever “talent scouting trip” last summer to Puerto Rico put him at ground zero. Part of the two-hour program will include an outtake on his trip. At play during his stay, in Kate he “saw the spirit of a true Puppy Bowl athlete,” Schachner says. The criteria, essentially, is simple: “They have to be a cute, adoptable puppy that’s not afraid to interact and go after a toy,” he says. After returning to New York City, where he’s a voiceover artist, he said he may have found a Puppy Bowl MVP. Pre-event, he’d only say that “Bella” was a “candidate in the mix.” Every year, multiple endings are shot, then kept secret. There’s also an audience component (real-time Twitter voting) that’s considered. At press time, the Arnolds—Mike’s a police officer in Whitehall, and Susan an English teacher at Emmaus High school—weren’t sure if they’d host a Puppy Bowl party, or relax, watch and tape it, then hold a party later. “I don’t want to be the host and miss seeing the event,” Mike says. In Puerto Rico, between Feb. 1-10, there was a concurrent quarterly Spayathon, a joint effort aimed at spaying-neutering 30,000 animals each calendar year, with plans to broadcast the bowl games inside the basketball arena-clinic.